A Virtual Patient (VP) is defined as: “an interactive computer simulation of real-life clinical scenarios for the purpose of medical training, education, or assessment” . There are various degrees of complexity in the types of VP scenarios, in their basic form a VP allows the user, to think about options and decisions they need to make based on some clinical information. The user is then presented with either feedback or more clinical information depending on the type of VP the user is playing. VPs are also known as Virtual Scenarios (VS) as decision making scenarios can be used in other disciplines outside medicine and healthcare. The simplest form of VP is referred to as ‘linear‘ VP which has been delivered by paper and computers. There is only a single pathway through the VP case like the traditional problem-based learning cases that were used at St George’s University. The patient information is given to the users in stages to allow them to discuss or think of possible option from the information already present to them, the case then carries on regardless of what the user has decided. These types of VPs are thought to be unrealistic as there are usually many ways to tackle the same problem but these are not explored in linear VPs. More complex VPs used at St George’s University are referred to as ‘branched‘ or “decision” VPs that offer choices to the user at different stages in the scenario. These branched VPs can be written on paper however due to the depth of the choices in the VPs these are better played on the computer on VP players such as OpenLabyrinth and DecisionSim (see below for more detail on technology). Branched VPs offer the user a chance to explore the different options available to them and follow consequences of their choices. Branched VPs can be used for self-directed learning, assessment or problem-based learning scenarios. Assessment VPs can be created in a number of different ways to test the user on their knowledge, the various types include: linear/ branched; scoring decision-points/ scoring end points; hidden scoring/ exposed scoring; continuous feedback/ end feedback only. There is a drive to prevent error through VPs to reduce the number of medical errors in practice. These cases are different to the conventional PBL cases and mimic the amount of information presented to a healthcare professional in real life (Find more information on Error cases through the TAME project). Ellaway, R., Candler, C., Greene, P. and Smothers, V., 2006. An Architectural Model for MedBiquitous Virtual Patients. Baltimore, MD: MedBiquitous. This case is a problem-based learning scenario case for the medicine course split into three tutorials, which runs over a week at St George’s, University of London . The case was re-purposed into a VP from a paper case and students identify their learning objectives as they run through each tutorial in groups 8 students and one facilitator. What is our experience around Virtual Patients? The e-Learning Unit at St George’s, University of London has contributed to the transformation of the Problem-Based Learning in the university making the cases interactive through the introduction of interactive PBL with the use of VPs. CROESUS – EC funded project which aims to move the clinical phase of medical education from traditional classroom teaching approaches to active learning using self-directed, personalised collaborative learning environments. ePNLnet – EC funded project which aims to create an International Network focused on Medical Education Centres (MECs) for the development and implementation of innovative teaching strategies starting with modernisation of the early undergraduate medical curriculum through the introduction of interactive PBL using VPs. Generation 4 – JISC funded project to replace paper-based problem-based learning scenarios with VPs. eViP – EC funded project which aims to develop a shared bank of enriched VPs across Europe. PREVIEW – JISC funded project to deliver VPs in virtual worlds for paramedic students. Jointly run with Coventry University and Daden Limited. The current international projects include, the TAME project to reduce Medical Error through the introduction of error VPs as well as the international project WAVES, to widen access to virtual educational scenarios. Furthermore, the e-Learning Unit develops and implements training on how to create a VP in SGUL but also organises tailored training for other national and international institutions that may are interested. SGUL have also published studies in the use of VPs for problem-based learning and assessment. Further studies in the use of VPs in Virtual Worlds, inter-professional teaching, and assessment have been studied and evaluated as well. OpenLabyrinth is an open source online activity modelling system that allows users to build interactive ‘game-informed’ educational activities such as virtual patients, simulations, games, mazes and algorithms. It has been designed to be adaptable and simple to use while retaining a wealth of game-like features. OpenLabyrinth is licensed under the GNU General Public License (GNU-GPL v. 3.0) – see Appendix 1. The application was originally developed by the Learning Technology Section of the College of Medicine and Veterinary Medicine at the University of Edinburgh, however the latest version includes work from the Northern Ontario School of Medicine, the University of Edinburgh and the Aristotle University of Thessaloniki, as well as input from partners in Canada, the UK, Germany, Australia and the US. The latest version (v3.4) of OpenLabyrinth has been installed and configured at St George’s University of London, and the link to access the same is (https://openlabyrinth.sgul.ac.uk). OpenLabyrinth is administered via an authenticated web user interface using a login and password. For more information on OpenLabyrinth, please visit http://openlabyrinth.ca/. UChoose is a web based educational training and assessment tool (www.uchoose.uwe.ac.uk) designed to deliver rich decision based, interactive simulations in a compelling narrative. This tool has been developed by the Learning Educational Technologies Team (LET) in the Faculty of Health and Social Care at the University of the West of England, Bristol. Incorporating rich features such as counters, rules, media resources, multiple choice questions and a powerful feedback system the user will be able to create or play through flexible and challenging learning experiences with the emphasis on decision making. Like OpenLabyrinth, vpSim is a VP player as well as an authoring environment; developed by the University of Pittsburgh. The system uses a flash-based graphical authoring system to create the VP map for medical education and assessment. Authors can easily switch between the editing and authoring modes to the VP player. vpSim is accessed via the web and is hosted from University of Pittsburgh’s servers. vpSim is claimed to be easy-to-use, faster and cheaper to create VPs, created for educators by educators and is an award winning system. From October 2015 DecisionSimulation changed the name of the company for Kynectiv (www.kynectiv.com). The development of the CASUS learning system for VPs began in 1994. The aim of the interdisciplinary working group, comprised of medical practitioners, pedagogical instructors and IT specialists was to develop an easy to operate author system for teachers in order to create interactive multimedia VPs for learners. Today, CASUS is a VP software provided by Instruct (www.instruct.eu). Instruct was founded in 2000 and is a corporation specialised in the development, integration and distribution of E-learning software for undergraduate and postgraduate healthcare training. It has gained appraisal for its innovative concept. Today Instruct is providing the E-learning platform CASUS for more than 150 universities and institutions worldwide with about 50.000 active users/year. eLU used VUE to draw visual maps of the VPs, with the shapes representing the pages (‘node’) of the case. VUE maps can be used to upload cases structures into OpenLabyrinth. 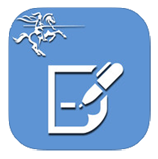 The i-Author app, is an interactive application based on a VP concept co-developed by the Intelligent Business Optimisation System Solutions (iBOS Solutions) and the e-learning Unit at St George’s, University of London (SGUL). The app enables users to create their own cases offline and ‘on the go’ using their tablet instead of a desktop computer. 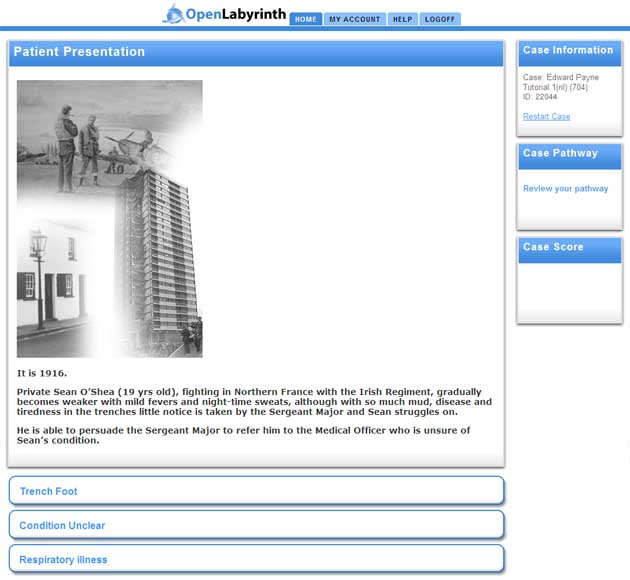 As authors of cases, the users are able to create cases containing personalised text accompanied with media such as videos, audio and images and also adding questions and scoring within the cases. Authored cases can easily be published to peers to collaborate on authoring the cases or published to viewers such as students employees or the wider community. Examples of the types of cases which can be developed using the app can be found on the MedEdCases and MedEdEthics Apps (these are medical and medical ethics scenarios). Find out more about the e-Learning unit apps HERE.